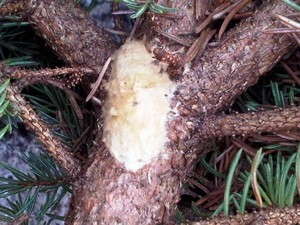 The first step in reducing the damage from gypsy moth caterpillars is to remove or control the egg masses. Each egg mass can contain from 100 to 1000 eggs. They can be found on tree trunks, branches, rocks, fences and nearly any other surface, including buildings. Scrape the egg masses into a container of soapy water (1 teaspoon of detergent per litre of water) and soak them for one week, or burn them in a woodstove. Another treatment is to spray dormant oil to suffocate the eggs. Remember that no single control method can eliminate the pest completely. As the caterpillar continues to grow, changes occur. When it reaches the point where it is about an inch long it will have 11 pairs of tubercles (spots) on its back. 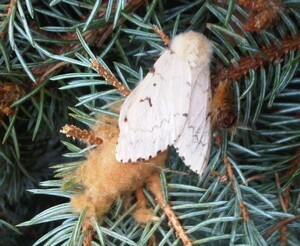 Now it moves off the foliage to hide in sheltered places on the tree or ground during the day and do its feeding at night. By this time in June, damage is more noticeable and extensive. The caterpillars are larger and can eat more foliage, devouring almost 7-8 square feet. Leaves are important to the survival of a tree. Leaves are needed to produce food for the tree. A significant leaf loss will impact the ability of the tree to store food for the winter. Some trees can be almost totally defoliated by the caterpillars. Although these trees may refoliate in July after the gypsy moth feeding is complete, this takes a tremendous amount of energy and food resources from the tree. The tree in effect is borrowing from its food reserves for the coming spring. While a single year of defoliation may not kill the tree, successive defoliations can seriously weaken a tree. This can have serious consequences on trees that are under stress from disease, crowding or other factors.